Silverfish are exceedingly gluttonous insects, boasting a voracious appetite for materials of plant origin that are high in carbohydrates and proteins. Not only do they feed on foods like cereal grain products and dried meat, they also have a penchant for wallpaper, book bindings, linen, cotton, paper, and silk, just to name a few. Silverfish are particularly long-lived insects, with a lifespan of roughly six years. They are nocturnal and can survive for weeks without food or water. While not actually fish, despite resembling one, they are most common in locations near water sources, like lakes, rivers, or streams. As such, they prefer humid environments, and tend to inhabit bathrooms, where moisture levels are high. Silverfish are typically seen in sinks and bathtubs, where they have become trapped while in search of moisture. 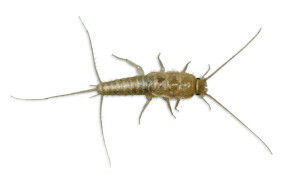 Given their affinity for moisture, reducing the humidity in your home or business is a good preemptive measure against an emerging silverfish infestation. So is limiting their favorite foods, by storing old papers, books, and starched linens in sealed plastic containers. However, once an infestation takes hold, a customized approach by a professional is recommended. Over the counter sprays may kill individual insects, but they do not get to the root of the problem, nests. Silverfish breed in a variety of places inside your home or business, including bookcases, wall voids, and in, or under, subflooring. They are also prominent in attics, a location we may be able to treat specifically, depending on access and environmental restrictions. Our technician will be able to assess your home or business, and tailor a specific approach to your Silverfish issue. Many times, addressing a Silverfish problem has the added bonus of eliminating other crawling insects too!